Alessandro De Marchi (BMC) took victory on the summit finish to Alto Campoo on stage 14 of the Vuelta a España from the day’s five-man breakaway, as Fabio Aru (Astana) held on to the leader’s red jersey. On the Vuelta’s longest day at 215km, it took 59km for a breakaway group to finally settle after a fast start, but when it did, the peloton seemed to settle into a more relaxed rhythm that gave the five that finally made it stick a chance for a stage win. 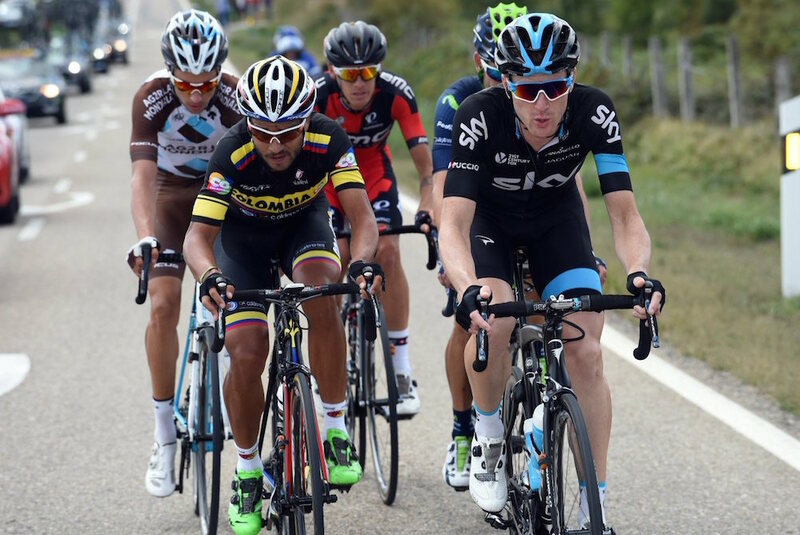 The four-men who joined De Marchi; Salvatore Puccio (Team Sky), José Joaquín Rojas (Movistar), Mikael Chérel (Ag2r-La Mondiale) and Carlos Quintero (Team Colombia), quickly established a nine minute gap to the main bunch and held that until the foot of the third and final categorised climb of the day to the finish. With no vested interest in chasing the break down by the peloton, the five riders were clear to dual it out until they would inevitably begin attacking each other on the final slopes of the finish. At 18km, it took some time on the road to Alto Campoo before the first attack came, but it was Cherel who made the first move with just over 4km remaining. He was quickly chased down though and the five remained together until they hit the foggy mountain air 2.3km from the top. After attacks by Cherel and Rojas, Puccio found himself out front alone before being chased down by De Marchi. The BMC man then immediately attacked his Italian compatriot and was out of sight of Puccio within the last kilometre. He was barely visible through the mist as he crossed the line, but it’s a second career Vuelta stage for De Marchi after taking victory in last year’s race when he was racing with Cannondale. Behind them meanwhile, the attrition of the day had seen an almost complete peloton quickly dissolve into a reduced group of GC teams on the especial climb, with Aru’s Astana teammates driving the pace on the front. The first GC contender to attack was Aru himself, as he tried to consolidate his hold on the red jersey ahead of Joaquim Rodriguez (Katusha) and Tom Dumoulin (Giant-Alpecin). Rafal Majka (Tinkoff-Saxo) and Nairo Quintana (Movistar) were the first to respond though, not letting the Italian slip out of their sight. The pace then slowed and allowed the likes of Rodriguez and Esteban Chaves (Orica-GreenEdge) to catch back on, however Alejandro Valverde (Movistar) and Tom Dumoulin (Giant-Alpecin) were unable to hack the pace and were distanced. While more attacks came, no-one was able to put much significant distance into their rivals, but it was Quintana who looked back to his best on the stage as he put six seconds into Rodriguez and seven seconds into Aru. Dumoulin and Valverde finished 19 seconds back on race leader Aru, but Dutchman Dumoulin held onto his GC position in third, albeit 49 seconds in deficit, while the Spanish champion slipped to seventh as Sky’s Mikel Nieve made gains in the absence of Chris Froome. Sunday’s stage sees another tough test for the riders and more opportunity for the GC contenders, as the peloton takes on a 175.8km course to a category one finish in Sotres.